Does your loved one really need another gadget? Probably not. Do they need to learn how to propagate mushrooms, become a natural beekeeper or design their own permaculture system? Heck yes! Give something awesome. Give the gift of skills. 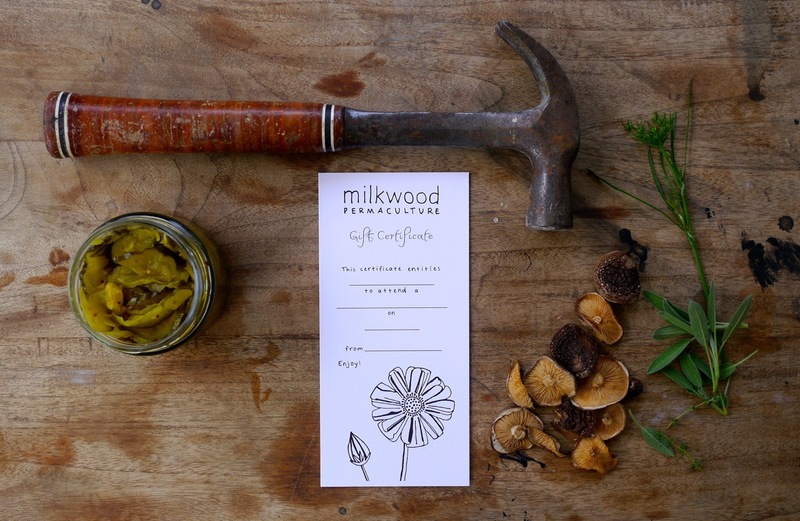 Purchase a Milkwood course in your name, and the request a gift certificate for your special someone via the online form below. We will email you a beautiful, illustrated certificate made out in the recipient’s name in PDF format, and instructions on how to print it. You decide if you would like cosmo flowers or fennel seedheads, and let us know. The lucky recipient can then use their gift certificate as a ticket to the course. You purchase a ticket for the course you want to give (when requested enter your email address in place of the attendees email address). Get in contact with us using the form below to tell us that you would like a gift certificate created for the ticket you just purchased. We email you the customised gift certificate (pdf) made out to your special someone. Get back in contact with us to let us know when we are OK to talk to the recipient and not ruin the surprise. The gift receiver comes along to the course! Gift certificates will be issued via email within 3 business days. Bookings made for gift certificates are transferable to other courses as per our normal policy. If you have any questions about how our gift certificates work, or you would like a custom gift certificate made up please use the form below to get in touch.